I wasn't sure if my heart could handle re-reading this book. Yet I couldn't not read it again, before reading book two, as it has been a whole year already since I first read this one. And oh, I'm glad that I chose to read it again. As I do feel like I had forgotten a bunch of details. Hmph. But also because I am now less afraid. I loved reading this book for the second time. I was scared that I wouldn't, but I did. I loved it so much. It didn't break my heart as much this second time, but I'm still angry and hurt about those things. I don't even know what to say about this book this second time. I'm too scared to read my first review, lol. And I don't think I will mention everything that happens. But oh, how I need to talk about this book again, even so. Because there is so much about this book that I love. Despite those things that make me hurt beyond words. I will talk about those things too. But first all the good stuff. Eee. And there is a lot of that. Which is why this book is again a five star for me. Because I loved reading it oh so much. Still so perfect. The writing in this book is just perfect. I love it so much. Just as I love Kendare like crazy. All her books are amazing. And I cannot wait to read more books by her. 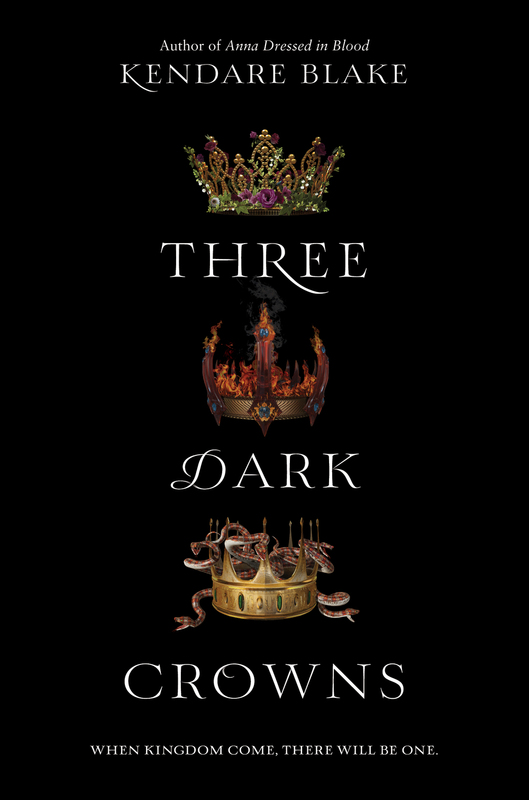 I loved reading Three Dark Crowns again so much. Yes, it is still heartbreaking and rude, but I still love most of it to pieces. And I really think that you should all read this book if you haven't already. It is worth all the pain. Well, I hope it will be worth all the pain, haha. But I think it will be. Especially now that there are four books instead of just two. So excited. This tells the story of three girls. Three queens. Three sisters. Triplets. They just turned sixteen years old, which is the year they will fight each other to death, for the throne. Only one will win. The others must die. They haven't seen each other since they were six years old. They don't know each other. They are alike in some ways, yet so different too. Each queen have their own power aka magic. Katharine has the gift of poison. Arsinoe is a naturalist. Mirabella is an elemental. All powers were so so interesting to read about. I love these characters more than I can say. My favorite of them all is still Jules, the best friend of Arsinoe. She is simply the most amazing and the girl that I love the most. She's so kind and loving and she's hurt so much and I am very protective of her. I want the best for this girl. Sniffs. I'm worried. Also, her familiar is the most amazing. Adorable. And ahh, Arsinoe. I loved her even more this time around. She's such a sweet girl and I grew to love her so much more. She is so strong and brave and awesome. I adore her. And oh, Katharine. She's my second favorite, though I might love her and Arsinoe the same. I'm unsure. Katharine is just all kinds of awesome and I just love reading about her. I love that she's not immune to poison at all. I love how she's shy at first, but that she gets stronger and braver. I loved her relationship with her boy. Sniffs. I want them to end up together so badly. Didn't like reading a bit about his past, aw, but I adored him even so. He was pretty cute and I loved reading about them together. Need lots more. But ah. Mirabella. She is the queen that I liked the least. But I can't say that I really have a real reason for disliking her. I'm hating on her because of what happens with Joseph, because Jules is hurt. But to be fair, it wasn't Mirabella's fault. And I can't really blame her for it at all. Ugh. But I do. A little bit. But even so. She is a pretty amazing character to read about. I loved her relationship with her friends. I loved her powers. I really liked that she remembered her sisters from before. But yeah, I just couldn't love her. Aw. But I loved reading about Arsinoe and Billy together. Eee. I ship them so badly. And they are simply the cutest. I need a kiss soon, though. I want them to fall in love. Pretty please. So cute. And Katharine and her boy. Such a sweet romance too, though not with the best ending. Ack. I'm nervous. Especially after peeking at book two, lol. Worried about everyone. I love these characters so much. They are amazing to read about and I'm so glad that I decided to re-read this book now. That I loved it the same way again. I can't not mention Joseph. Sigh. He and Jules just started together, as he had been away for five years. They were best friends before he was banished. When he came back, they became more than friends. And oh, I loved reading about them together so much. I ship them badly. Jules loves him so much. But yeah. This romance gets ruined. And in the worst possible way. A way that I hate beyond words. I still hope that it wasn't Joseph's fault. Because I still want him and Jules to be together. Sniffs. Maybe. Ahh. There is just so much in this book. I loved reading about all three girls so much. I loved getting to know them and getting to know their lives and getting to know all the people around them. And oh, this island. It's beautiful to read about. And horrible too. And I want to know so much more. The plot is pretty exciting too. Not going to say anything about it, just that it's awesome and I love it so. This book is still perfect to me. Despite my broken heart. Despite that evil ending. Ack. Such a stunning story. Go read it. Right now. 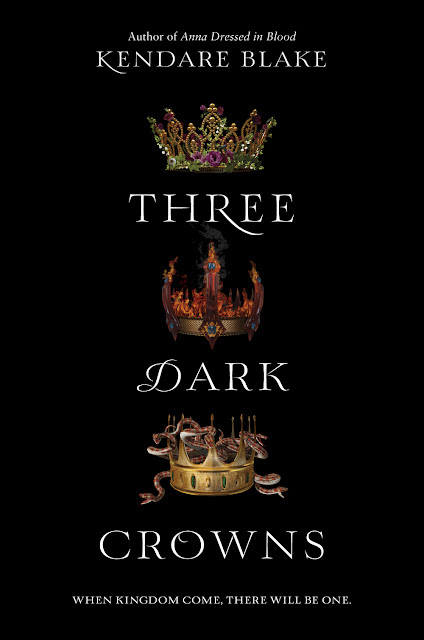 Three Dark Crowns. One Dark Throne. Kendare Blake. The Book Depository. Amazon. My First Review.